This very large and beautiful General Grant's Board is made from several different Hardwoods laid together to create this nice heavy solid board. These boards are individually handcrafted and one of a kind. Therefore, the board you receive may vary in design from the image. The diameter of the board is approx. 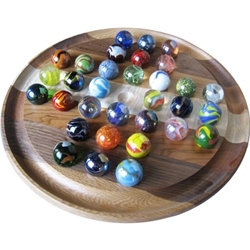 16" and comes with an assortment of 32 Jumbo (1 3/8" diameter marbles or 35mm) marbles. Refer to the bulk marbles - Jumbos page of our website if you would like to specify the colors and styles of the marbles that you would like to receive. Specifications can be made in the order notes section of your checkout process.